As you have already understood, your main task is to set the best record. Choose the best Lego sport car and beat all your opponents. Everything is up to you! Use only the arrow keys to move and collect bonuses on the way to the win. Are you ready? Then go! Would you like to e the real champion? Then this game is for you! 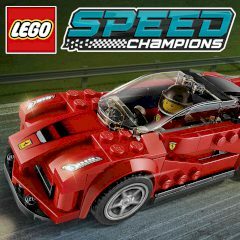 Just get behind the wheel of a boosted car made of Lego and in each race try to meet the specified challenges and reach the finish at the first place. Do not forget to collect as many bonuses as possible and avoid the mud, cause it will make your car slowly. There are also some nitro, use them and become the real champion! Well, this game is for you, be sure. Just step on the juice and you will have so much fun here. Enjoy the game.